The ear is made up of many parts that have varying topographies. Most of these ear components are structurally either convexities or concavities which is due to the cartilage that lies within. The lone exception to this topography is the earlobe, the only part of the ear that does not contain cartilage. This makes it unique at the bottom of the ear as an attached skin segment. 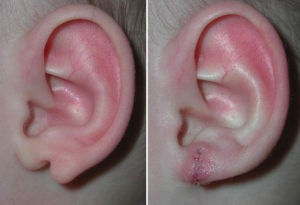 Because of the ear’s complexities it is prone to a large number of congenital deformities both in shape as well as in missing some of its parts. The one lone exception is that of the earlobe which is almost always present even when other parts of the ear are missing. (e.g. microtia) Its shape may often be small and it may be separated and displaced more inferiorly and anteriorly on the face, but it is almost always there. A cleft or split of the earlobe is a relatively small congenital ear deformity that is also fairly rare. The ear is embryologically formed by the development of six nodular swellings (hillocks) on the mandibular (first) and hyoid (second) pharyngeal arches. There is some debate as to which hillocks contribute to which part of the ear. But it seems most logical that the last or sixth hillock becomes the earlobe. Thus a cleft earlobe is the result of some malformation of the sixth hillock. 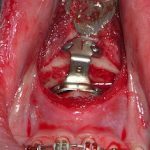 Repair of the cleft earlobe is no different than that of repairing a split earlobe in an adult. The split is wider and the size of the earlobe smaller but the surgical principles are the same. 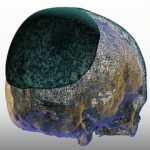 The two halves are reunited to create a single earlobe ay the bottom of the ear cartilage framework. The timing of cleft earlobe repair is completely optional. It can be done as early as one year of age. Most parents like it done before the child starts school.